To start off I always prep my skin with serum and moisturiser. 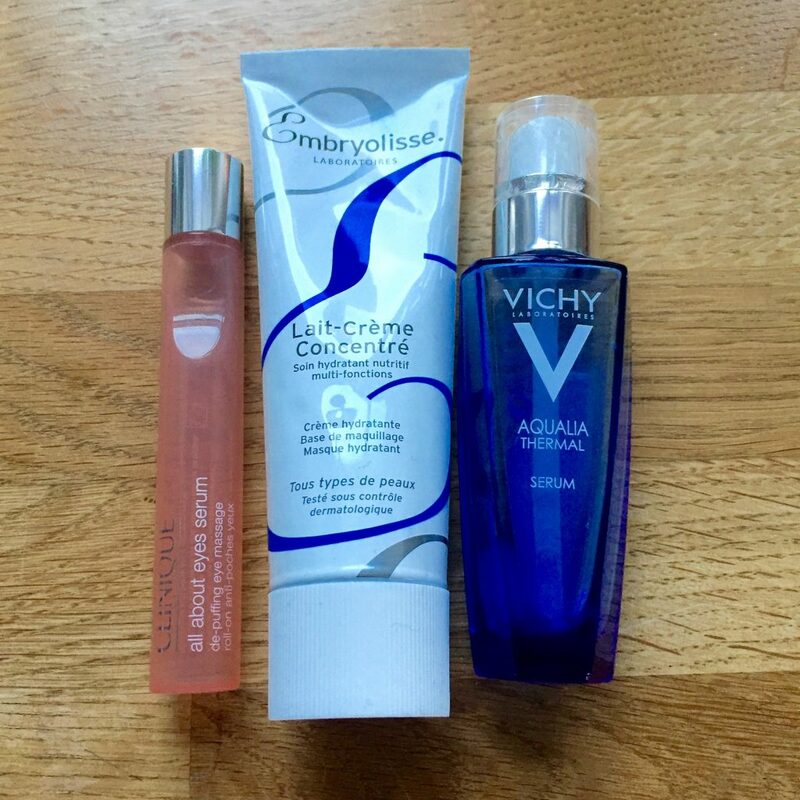 At the moment I’m using Vichy Aqualia Thermal serum and Embryolisse Lait-crème concentre cream. The serum is silky, hydrating and leaves my skin looking juicy and plump. The moisturiser is light, fresh smelling and has a natural matte finish – a great base for makeup. After prepping my skin, I usually go in with Charlotte Tillbury’s Wonderglow primer. I love the luminescence that it gives my skin (so much so that I used it on my wedding day. ); it also keeps my makeup on my face all day – who doesn’t want that?! 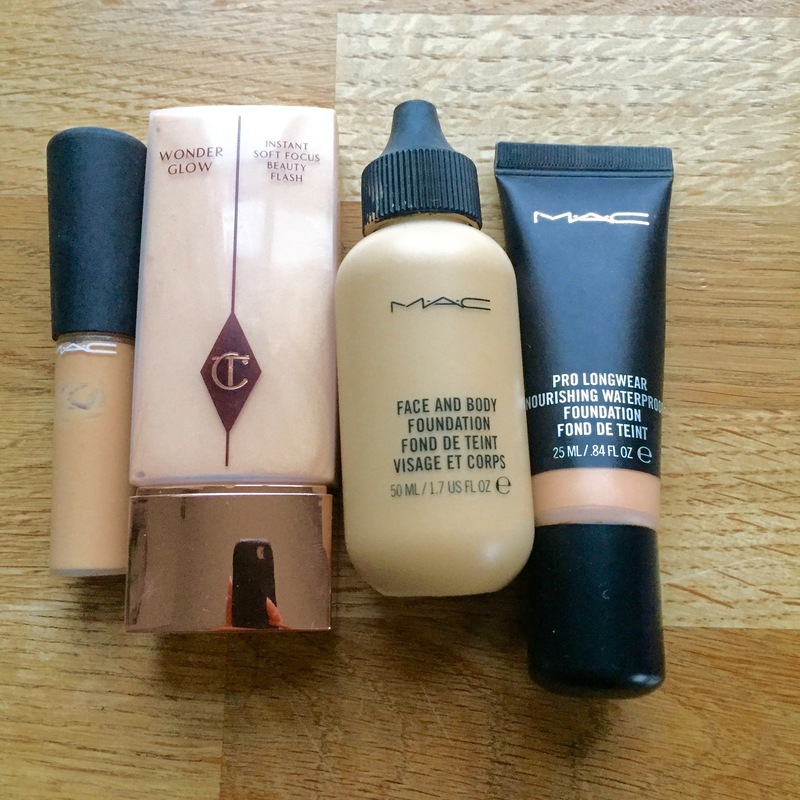 I currently have two foundations in my makeup bag, both by MAC. The first is my one true love – Face and Body. It’s a sheer, long-wearing foundation that makes my skin look even, flawless but it’s not heavy in any way. It gives the effect of no makeup makeup and I absolutely love it. For days where I need a little bit more coverage and TLC, I use the prolongwear nourishing waterproof foundation and again it kinda does what it says on the tin – it’s a long-wearing waterproof formula with a medium coverage and dewy-ish finish. I use a tiny amount (because I don’t like too much coverage on my skin) and buff it into my skin with my Real Techniques Expert Face Brush. After foundation, I will then use a concealer as needed (generally on my under eye), I’m currently using MAC Mineralize concealer. It’s a goodie but I use it with a domed fluffy brush (like MAC’s 286 brush) so it doesn’t look too heavy. I have just run out of the NARS creamy concealer which has gone on my ‘to replenish list’. It was ace. I tend to use a cream blusher so give my skin a natural flush. My base looks unfinished without blusher but I never want something too strong or heavy. I’m currently using a Laura Mercier Crème Cheek Colour, in Sunrise and I really like the texture and the way it melts into my skin. I’m totally addicted to MAC’s Cream Colour Base in Hush (it’s a cream highlighter). This is a staple in my kit and my own makeup bag. I LOVE it. It gives a very subtle sheen to my skin so it looks perky and healthy but not over the top. When I’ve got tan, I use Improper Copper Cream Colour Base to give me a touch of sun kissed glow. 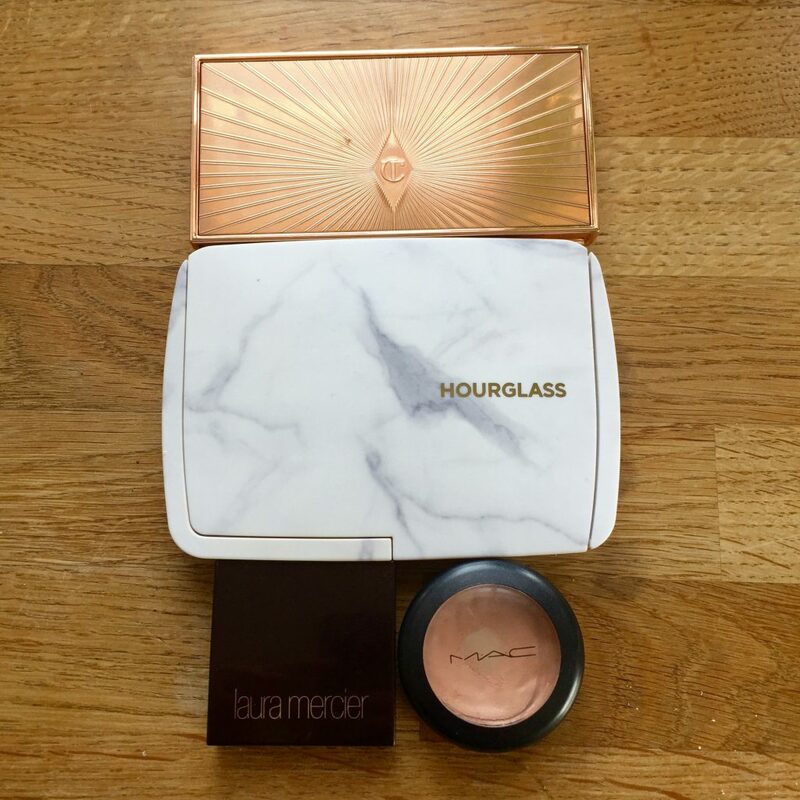 I also have an Hourglass palette (ambient lighting edit – surreal light) in my makeup bag, which I bought at Christmas time. 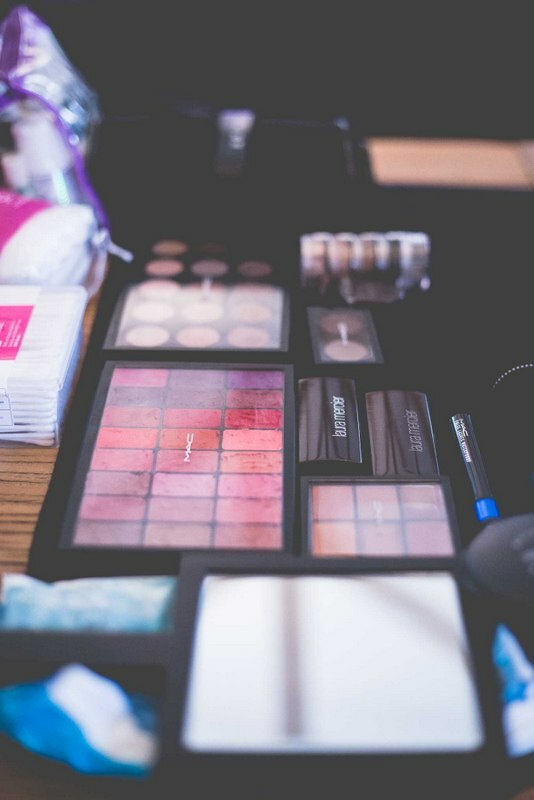 It’s made up of a bronzer, two highlighters, two blushers and a finishing powder. They are beautiful, luminous powders which make me skin looks like its been lit from within. It was a splurge for me at £69 but I do really love it and can totally see what the hype was about. Other bronzers, which I have loved in the past, include: NARS Laguna Bronzer and Benefit’s Hoola bronzer. These are favourites of mine, which I have replenished more than once. They both are a golden brown to give a natural sun kissed glow. I go through phases with my brows, sometimes I use a brow powder (I had an Elizabeth Arden one that lasted me for YEARS, it was great) and sometimes I use a brow pencil. If I’m using a brow pencil then I like MAC’s eyebrow in Brunette; it’s a fine self propelling pencil. Be warned though: you never know when it’s going to run out, you can’t wind the pencil back down and where it’s a very fine wax, it can easily break if you use too much pressure. Having said all that, I use it most days, it’s quick, easy and effective. Once I have put colour through my brows, I always finish by setting them with a clear brow gel. I like to brush my brows up so they look full and fluffy and the gel keeps them in place all day long. 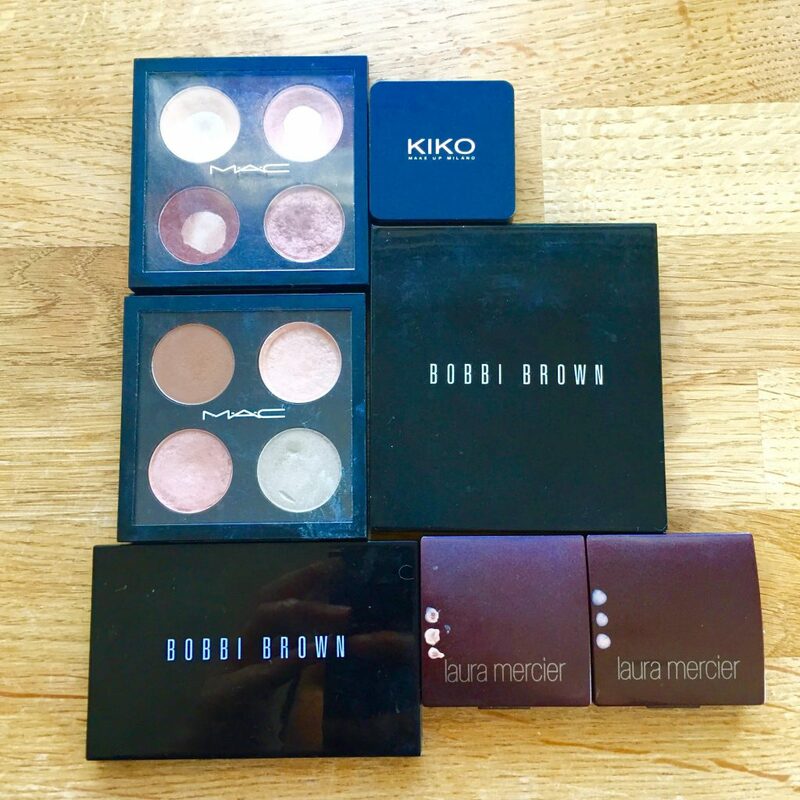 I have a variety of eye shadows in my makeup bag, predominantly by MAC, Bobbi Brown and Kiko. They tend to be in neutral shades (I am a particular fan of the warm brown smokey eye and absolutely adore MAC’s Antiqued eyeshadow) and a variety of textures from matte through to shimmer and even sparkle. I do like a good eye primer, which is so important to get the most out of your eye makeup (think of it like Velcro for your eyeshadows). I love Laura Mercier’s eye basics; I also like MAC’s prolongwear paintpot. Both of these are coloured cream eyeshadows so they can be worn alone or with a powder eyeshadow on top. I have a couple of mascaras in my makeup bag. My favourite waterproof mascara is Max Factor’s masterpiece mascara. I particularly like the wand on this one. This is also a staple in my kit. I also have a sample of MAC’s In Extreme Dimension mascara, which I like a lot, as because it’s a sample, there isn’t too much product on the wand so you can really build your lashes. My favourite non-waterproof mascara is MAC’s mineralize multi effect mascara. It’s a great texture for full fluttery lashes. I couldn’t replenish this at Christmas, as it wasn’t available on their website; I sincerely hope it hasn’t been discontinued. 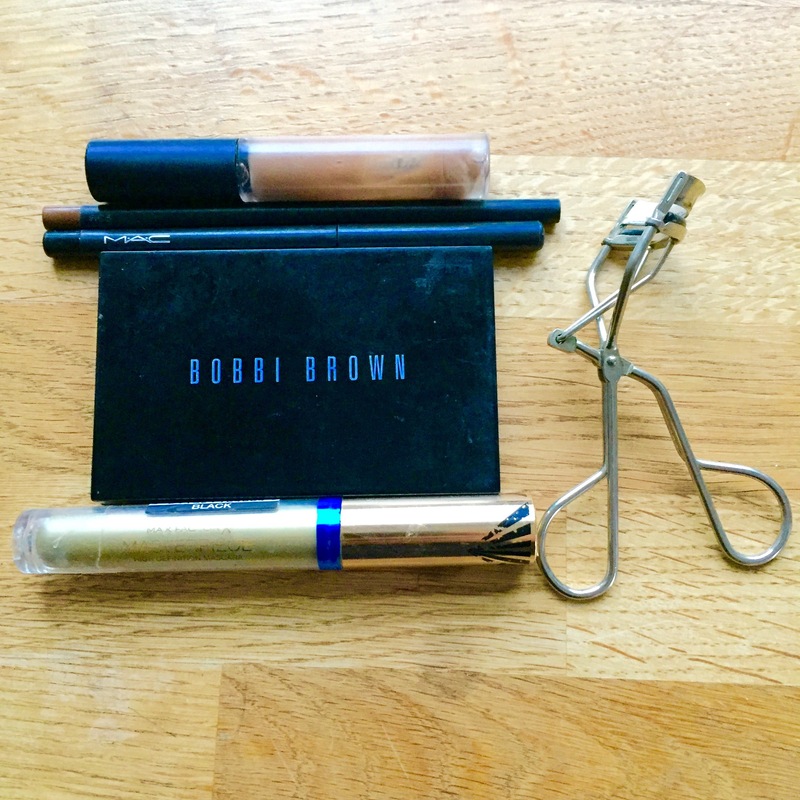 I have a few eyeliners in my makeup bag – a Bobbi Brown gel liner which I rarely use (but only because I rarely do a winged eyeliner) and a couple of MAC’s technikhol pencil. The technikhol is a mechanical pencil-style liner, which I particularly like to use to tightline my eyes (also known as invisible liner – it’s the best for deep-set eyes like mine!). I also like the technikhol because the liner sets after a couple of minutes and then doesn’t smudge – winner! I splurged on the Crème de la Mer lipbalm a few months ago and have not looked back. Yes it’s expensive but it also a dream. It feels and smells amazing and my lips have never been in such tiptop condition – even through winter!! I’m relatively low-key with my lips and usually sling either a gloss or a sheer lipstick on, if I remember. The lipgloss I have been in love with for over a year now, is Bobbi Brown’s Pink Blossom lipgloss. It’s a sheer, pretty coral shade that looks like my lips but better. 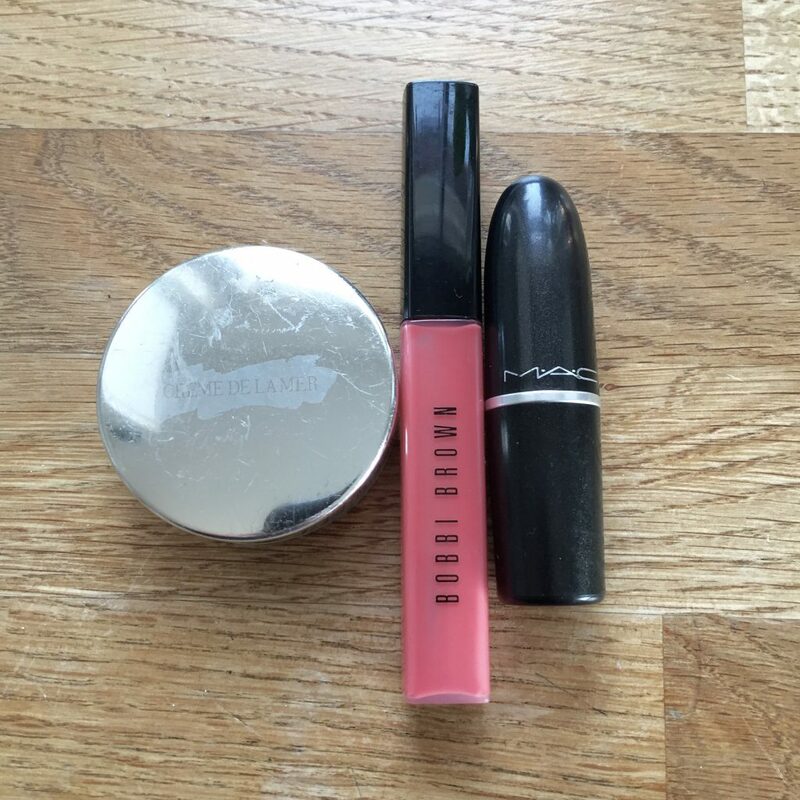 The lipstick that I have now repurchased three times (for me personally as opposed to my kit, although it is a staple in my kit too) is MAC’s Shanghai Spice. Again it’s a sheer, sheeny coral shade in a creamy moisturising formula. 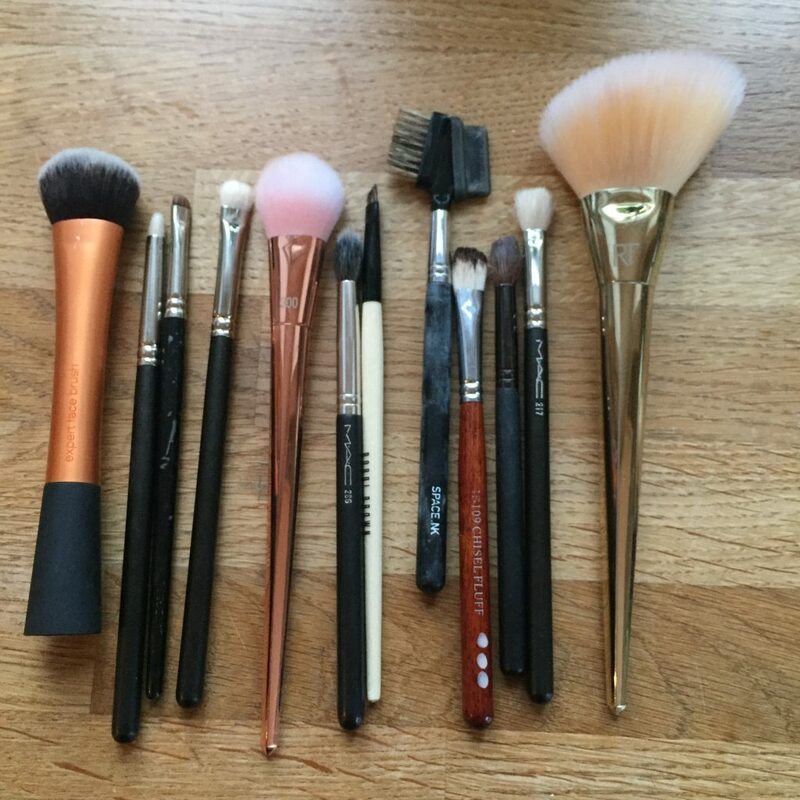 I have variety of personal brushes that I keep separate from the ones in my kit. The ones that I use on a day-to-day basis are by a medley of brands including: Real Techniques, Bobbi Brown, Laura Mercier, MAC, Crown brushes and Space NK. I keep them in an old jam jar next to my makeup bag so they are always in easy reach. The other tool that I also couldn’t do without is my eyelash curler. I have very long but straight lashes and if I don’t curl them first, the effect of my mascara is minimal. It sounds like a lot of work but it takes a matter of seconds and the effect is, for me, SO worth it!! 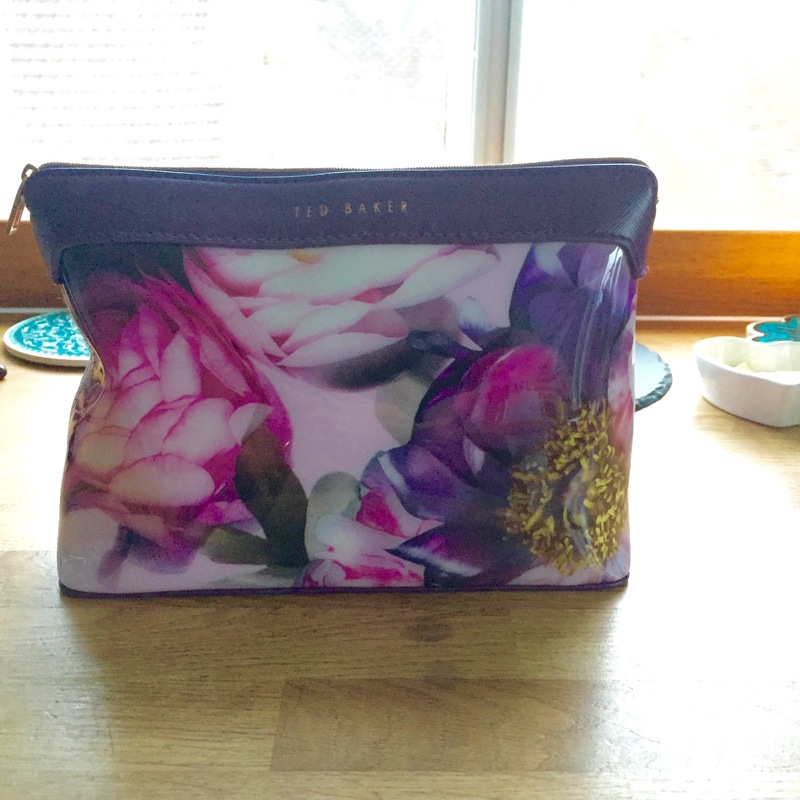 I hope you found this insight handy – what’s in your makeup bag that you couldn’t do without?